THE ORIGINAL Dracula film, the first cinematic interpretation of Bram Stoker's novel, and one of the greatest horror films of all time - Nosferatu - will be screened in Galway - accompanied by a live soundtrack from the ConTempo Quartet. 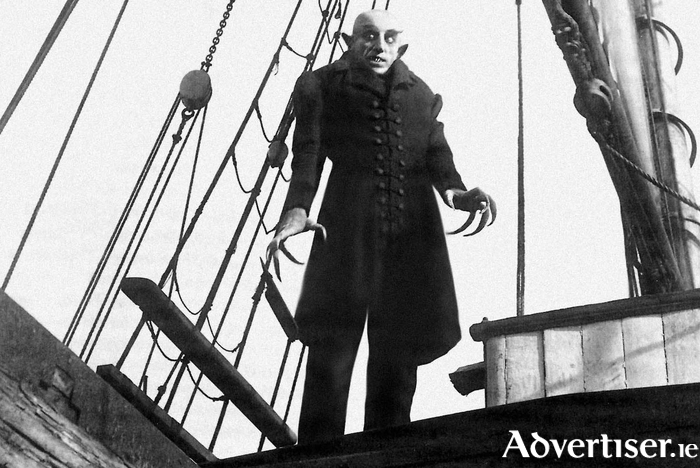 A silent film made in 1922 by German film-maker FW Murnau, it starred Max Schreck in an unforgettable role as the Count - his long, claw like fingers; delicate, yet deadly movements; and goblin ears and sharp, sinister, features on an immaculately bald head make him a genuinely unnerving presence onscreen. The film also created some of the horror genre's most iconic moments - the shadow of Dracula creeping up the stairs and the count rising from out of his coffin. A masterpiece and still scary to this day. Nosferatu will be screened in The Huston School of Film and Digital Media on Thursday October 26 at 7.30pm. The ConTempo Quartet will perform a special live score composed by French specialist Baudime Jam in 2002, to provide a fresh soundtrack for the movie, and originally performed for the Prima Vista Quartet. The score has since become part of the repertoire of a number of other renowned string quartets including the Debussy Quartet. Tickets are €10/€5 via www.eventbrite.ie or on the door. The Huston School of Film and Digital Media isdlocated across from Galway Cathedral. Sky Road Film Festival features an exciting lineup, the festival takes place on Saturday October 14th!